In March 1972 the prototype was issued during the Geneva automobile salon at the Pininfarina station as Fiat 124 sport Rally: A red-black Spider with Hardtop, already at first sight more broadly based, deeper and faster than the series-Spider. Here is still another 1,6-Litre-engine supposed sat under the hood... On the Turiner salon in November 1972 stood the Rally then decoratively in the midst of four Monoposti on the Abarth-area. "Halfstrongly", a german magazine flouts - only a car like the Abarth Rally had to come along so broadly based. In the back and in front plastic flared wings had been attached, in order to accommodate the broad "shoes", Pirelli-CN36-down cross section tyres (185/70 VR 13), with the 5 1/2-inch magnesium rims of Cromodora (CD 30). 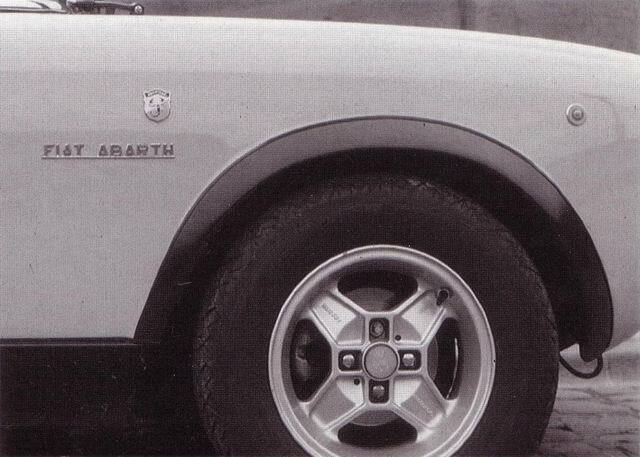 Differently than the series version, which was already shown in turin under the correct type Fiat Abarth 124 Rally (CSA), the lateral Abarth Logo together with the type designation as well as the front louvers under the turn signals were missing with the prototype. But its red-referred seat. The cars with the remarkably flat black surfaces in the basic colour were painted only in white (code 212), red (code 152) and light blue (code 480). The very most CSA went white to the customers, followed from the red-black version. Only 60 units should be delivered by the light blue execution. The colors changed failed later, for example the red more brightly and brighter. Shrill combinations remained as matt-red / poisoned yellowish green reserved for the racecars. Exactly like those competition cars, which should start in the group 3 or 4, the CSA was in the civilian Stradale version equally a compromise. Because first times buyers had to be found. Thus i.e. the homologation for racing had to remain, a certain measure of comfort maintained despite the actual purpose. Whereby the subsequent treatment of the civilian CSA for the work-high-prepared running execution (Vettura uffiziale) naturally still some more at expenditure required. The CSA was installed on an extra band directly at Fiat, whereby Abarth contributed the rear axle suspension and those moderately tuned engines and Pininfarina the bodies supply, which were partly facilitated and partly strengthened. Safe is safe: All highly stressed spot welding were after-welded. 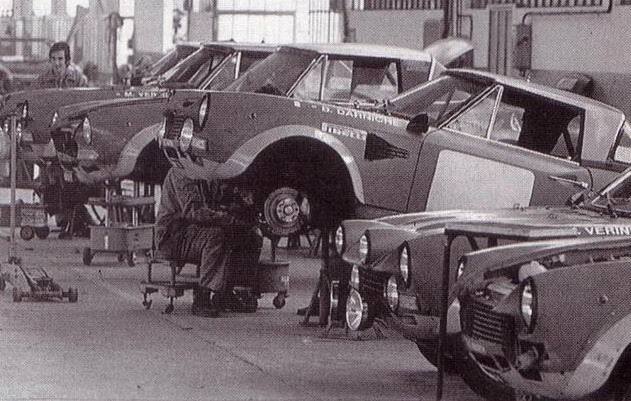 At least at first Abarth specialists tested the finished cars and procured the finish. The oft-quoted Corsa-remarks so never gave it; here it always concerned "civilian" CSA, which could be high-prepared using of Abarth tuningparts. Only the 50 - 70 automobiles, which were world-wide used during the three official running years by the Fiat department, were revised again in the Abarth company in the Corso Marche 71. The offer at homologierten parts, which made the structure possible of competition versions, hardly left desires open. Here a short view of the Abarth delivery program: 68-litre-tank, tank underbody protection, straight-interlocked running transmission (over Colotti), drive shafts and spear-differential (optionally also for the series CSA), still larger flared wings, larger oil pan from aluminum and oil pan protection, four-in unity elbow union and running exhaust, more effective mounting plates and reinforcement for gearbox-suspension and cardan-shaft, adjustable brake pump, combined water oil cooler, mechanical radiator exhaust, open air cleaners and light flywheel improves front props for the re-equipment of the rollbars to rollcages, strengthened chassis, with better thrust props, stronger feathers/springs for the absorbers, roll-stored shock absorber admission, Corte & Cosso absorber, 7 x 13-magnesium rims (order by Cromodora). And so on and so on. Piston forged by increases in output by means of sharper cam shafts, titanium piston rods, to refer sodium-cooled valves and larger 48-weber-carburetor (starting from 1974, but not from Abarth, but directly over weber).